Elegant Log Cabin Home with Astonishing Sunset Mountain Views. Private Hot Tub & Golf Course Access. Why do we go to the mountains? Is it for the wild freedom we feel standing before the vast blue skies stretched out before us? Is it for the exquisite reminder of how insignificant we are when we are presented with the majesty of towering mountain peaks? Or maybe it is something less profound. Maybe it is simply those quiet moments gathered around the fire with loved ones as memories we never imagined gradually take shape. So why do we go to the mountains? We go to the mountains to remember what is important - friends, family, fresh air. Adams Ranch 249 provides the perfect backdrop for these precious occasions. 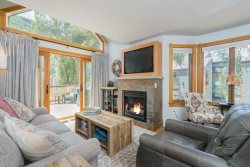 Large picture windows frame the San Juan mountain range lining the horizon, a fire in the hearth heats the great room, a private hot tub swirls just outside. Whatever you need from the mountains, Adams Ranch indulges you.